What is the rabbit doing and why? What is that rabbit saying? Bunny body language and grunts, growls, squeaks and screams. Early on during the second month we had Tigger, we had to board her for a weekend. We had an out-of-town committment and started looking into options of caring for her while we were gone. We didn’t know anyone else who knew how to care for rabbits and when we checked with the vet, although they knew people who did rabbit sitting, they said they couldn’t recommend them. So we checked into having her boarded by the vet. It was really hard planning to leave her, she was a little less than four months old and still baby tiny at about three to three and half pounds. We packed up a bag for her with her pellets and hay. We brought along one of her small litter boxes with her litter and brought some toys she liked. We also brought along a small cardboard box with a hole cut in the side. I had written out a paper that started out, “Hi, my name is Tigger … with what she liked, didn’t like and what really freaked her out. Never let it be said that Princess Tigger traveled lightly. We probably had about five to ten pounds of stuff that came along with her. I even had all her food packed in a cute Tigger bag. We arranged everything in the kennel cage for her and put her in. We tried to bring everything we could that would make her feel that she was surrounded with her own things and had all her usual foods. It was easier that she wasn’t on fresh greens at that point yet. Then we left for the weekend and it was really hard wondering how she was doing. She was all alone back in an environment like the pet shop again with lots of other animal sounds nearby. On Monday when we went to pick her up, as the kennel manager was leading us back to where she was being kept, he told us she had spent the whole weekend hiding in the cardboard box and had only come out briefly at times to eat, drink and use the litter box. He said they had barely seen her. As we approached the corner of the aisle her cage was in, we weren’t expecting to see Tigger after what we had been told. Instead, we saw her right away. She was in the corner of the cage closest to the aisle and was sitting up on her hind legs stretched out to her full height. It was pretty clear she had heard and recognized our voices and was begging for us to take her home. Blaine says it is okay to say that the sight completely melted his heart and turned him into a blubbering idiot. I have to take his word on that. All I know is that he bundled her into her carrier and took off with her while I was still gathering things up and then settling the bill. One minute they were there and the next, I was on my own. When I got out to the car, Blaine said we were never going to leave her all alone anywhere again and we didn’t. It made us realize that Tigger was not going to be a good single bunny. She was simply too unhappy and scared being left on her own. We realized that we needed to find her a rabbit buddy. Next week, I will start to tell the tales of how that came to be Shadow. There are a couple of things I will write about that some may feel falls in the too much information category. In case anyone else finds themselves dealing with similar things bunnies do that aren’t quite for polite society, just know you aren’t alone. So, teenage hormones in any species can be a train wreck for everyone trying to deal with the raging hormone levels and behavior that can go with them. I had read about the territorial aggression and sexual frustration that can be seen in unaltered rabbits. 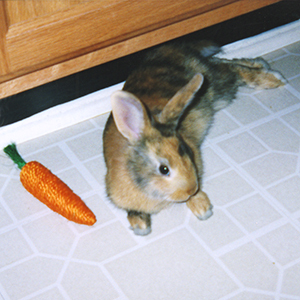 Although my early house rabbit experience was with an unaltered male, he had been a pretty mellow little guy. I wasn’t quite sure what to expect with Tigger as she neared the age to be spayed, but had read that rabbits who aren’t spayed or neutered can be quite a destructive handful in addition to all the babies they can produce. Tigger’s chewing behavior was decidedly starting to be a problem. Now this part of female rabbit hormonal behavior I hadn’t seen written about before and would have questioned if I hadn’t experienced it with two little girl bunnies myself. The first experience was with Tigger as she was turning about five months of age. She was getting to be a tiny terror with her attitude going over the edge from sassy cute to just plain ugly. Worse, there came times that she actually frightened me. She was still only about four pounds of bunny, but I found myself one day sitting on the guest bed as she was stalking around me and giving me what I can only call nasty evil looks. I was afraid to take my eyes off of her as she paced behind me, because I truly thought she just might charge me and bite me. There was a look in her eyes I had not seen from her before. It was clear she suddenly regarded me as the enemy for some reason. So what had set her off? Guys, I apologize, but the little stinker was obviously quite aware I was putting out my own female hormones quite strongly. She was not liking it one little bit. I didn’t really put it together until a few days later when she was suddenly calmer right in sync with me. I had a couple of months before she was old enough to be spayed and another afterwards before all her hormones left her system to see that she was not liking my hormonal times at all. She was four pounds of female rabbit anger and outrage. She did the best menacing stalking I have ever seen in an animal so tiny. I was genuinely relieved a month after her spay when Tigger mellowed out again to just her original energetic sassy self and I didn’t have to keep watching my back at times. This wasn’t just a fluke with Tigger. The second time I experienced hormonal clashes with a female rabbit was when Blaine and I had agreed to help out by caring for and showing a rescue bunny that was being kept at a local pet store. We went in on a Saturday to clean out the rabbit’s cage and set up a pen for her to run in to let people see her and get to know her. 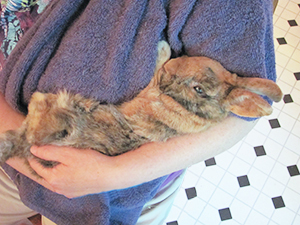 She was just out of recovery from her spay and had been described as a really sweet interactive rabbit. So, I wasn’t prepared at all for a rabbit that wanted to attach herself to my ankle and gnaw away like a rabid animal. It was really hard to tell people what a wonderful pet she could be for them when they would look down at her and ask me, “Isn’t she biting your ankle?” I finally had to step out of the pen completely and let Blaine take over. She didn’t seem to be having any problems with him. Like Tigger, she had recognized that another active female had entered her territory. She obviously still had enough hormones in her system to recognize and respond to what she regarded as a territorial threat. The second less mentioned thing about our Tigger is that she truly was a little stinker. Very early on, she was laying up on top of her cage with her back to me as I kneeled on the floor to pet her when I got a huge breath of noxious air. I thought, oh wow rabbit, what did you just do? When I moved her behind, there was nothing to see. That is when it dawned on me that Tigger had just let out a silent but deadly (SBD) gaseous cloud large enough and stinky enough to make a skunk proud. I wish that I could say the SBD was a one time event, but Tigger had a habit of being able to produce an unending supply of gas if she got freaky nervous. She would run around the room spewing toxic gases and would quite literally clear the room, because it was unbearable to stay. We would be gasping with our eyes running as we fled for clearer air. There wasn’t anything the vet could find wrong with her on exams. 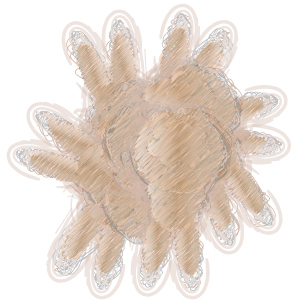 It was a heck of a defense mechanism against being picked up or chased by Shadow. If she was wanting to be left alone, she knew how to accomplish it! So what is a kitty cat bunny rabbit? Tigger had so many characteristics like a kitten or cat. First there was her desire to scratch rather than bite. She was constantly grooming herself more than any cat I have ever seen. She was very conscious of keeping her fur in pristine condition. We read a suggestion when Tigger and Shadow were little to use a spray bottle with water to give bunnies a squirt to discourage bad behavior. Well Shadow would shake water squirts off like a puppy and continue being bad. Tigger hated the water and would slink away like a cat, but furtively try to sneak back in later to continue when she hoped we weren’t watching. Tigger was very independent. She knew her name, no and lots of other words, but whether she responded, depended on whether she decided she felt like it. She loved to preen for the camera. And she wanted to be petted, but on her terms. Those cute kitty style flops we showed on Wednesday, she would often get into the sweetest curled up positions and then look straight at us with those beautiful brown eyes. It was an invitation to come pet her, she was ready and waiting now. We called it her cute bunny con jobs, still we fell for it every time we saw it. The altered photo art piece I have shared today was created with the magic of Photoshop since I couldn’t ever catch this on film in real life. Later in life, Tigger was more proactive and just a bit less distant when she wanted to be petted. She would come to where we were sitting on the sofa or loveseat, stand up on her hind legs and peek over the edge to catch our eyes. Then she would sink back down on the floor and hen up or flop out right below where our hand would be so that we could just reach down and pet her. She was a bunny who purred. She would tooth purr when we petted her, when Shadow groomed her or when you talked to her sweetly from across the room telling her she was a good bunny. It was so soft, you rarely heard sound, but would feel or see her jaw gently moving and would know she was happily purring away. Coming next week, Tigger gets into everything. You worked it baby girl! From early on when the camera would come out, Tigger would pose. This series of photos was all taken at one time within just a few minutes. Tigger seemed to instinctively know to show off all sides of herself to the camera. We really believe she knew she was beautiful. She had a way of moving that was dainty, delicate, precise and smooth. Unless she was freaked by something, she was all very coordinated ballet like moves. She may not have liked being picked up, but she loved attention. If I brought out a camera and was taking pictures of Shadow and had no idea where Tigger was, usually within just a few minutes she would be hoping in and taking over the photo shoot. 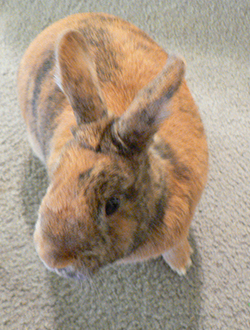 Besides her desire to pose, we called Tigger our model bunny because of her finicky eating habits. She was always slender, bordering on anorexic thinness and quite fussy about her food. We always joked she was on the model diet, avoiding eating whenever possible, but grabbing yummy treats from time to time. Tigger would sniff meal offerings and sometimes hop away. We would put salad greens on a plastic picnic plate and she would sometimes take the plate and toss the salad. Other times she would overturn pellet or hay bowls if they weren’t to her taste. There was nothing physically wrong with her that the vet could find, she was just a really picky eater. One time when we had Tigger, Shadow and Portia, we received new pellets and hay from our regular company and the taste obviously differed significantly from past seasons. All three bunnies turned their noses up at the new food. We got some of the old season and mingled it in with the new and within a couple of days Shadow and Portia were eating it. Tigger held out for two weeks refusing to touch the new. We were feeding her lots of greens to make sure she was eating enough and checking her weight too. We spent a lot of time during the first five years of Tigger’s life following her around begging her to eat. Then she suddenly started to eat as if she was making up for all the years of lost time. 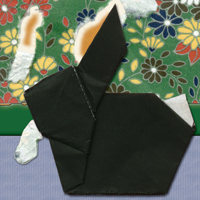 We said that it was obvious our model bunny had retired and now intended to enjoy life to the full. We had never thought we would see our Tigger chubby. The last six years of her life we had to watch that she didn’t eat too much fattening food. We had to protect Shadow so that she didn’t hassle or attack him trying to steal his treats or push him away from food. She would run dancing around our feet as we carried food and dive at the plates of greens as soon as they were put down acting like a starving rabbit. Sometimes she would move to stand on the plate hovering above the food making it hard for Shadow to get his share. She became chubby at times and we would have to put her on a more restricted diet to get her weight back down again. So, How Many Chins Does a Rabbit Have? My toys must have my scent! The title is a bit of a trick question. As a noun, a rabbit has one chin. Turn chin into a verb by saying a rabbit chins things and a rabbit has as many chins as they want to have. Tigger was religious about chinning things. She would make the rounds on a regular basis chinning everything in her cage and her play area. I knew that rabbits had a scent gland in their chin and liked to claim things by chinning them, but I had never seen any other rabbit be quite so territorial as Tigger. Tigger was always on the move and as she moved she would chin things. It was almost as if you could see the little bunny mind thinking, “This is mine, this is mine and this is mine too.” Everything was regularly and thoroughly claimed by Tigger. It was hard to pet Tigger because she was so much on the move. 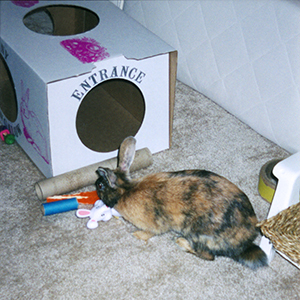 After she would hop into her cage to get her bedtime treats, she knew it was settle down time. It was one time we could usually open up the cage door and be able to pet her (blocking it with our bodies though against potential escapes). There was a ritual first that had to be observed before we could actually pet her. Tigger would sniff the hand reaching in. Then she would chin the hand. Only then would she lay down and put her head down in position to allow the human hand to pet her. The rituals that were so much a part of Tigger are what had us calling her Princess very early on. She wasn’t ever ready for interaction with any living being until she had observed her rituals first. You had to know how you had to present yourself to Tigger or she would be hopping away in a huff. 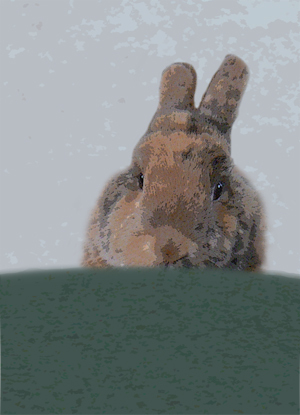 The little nose would go up in the air, the back would turn and then off she would hop, sometimes with a thump. Anyone else have a rabbit with an abundant number of chins?